A Higgs Boson type particle, perhaps an extremely heavy variation of it, may have been detected by the Large Hadron Collider, say CERN physicists, who spotted unexpected data spikes from two detectors. CERN is the European Organization for Nuclear Research, located in Switzerland. 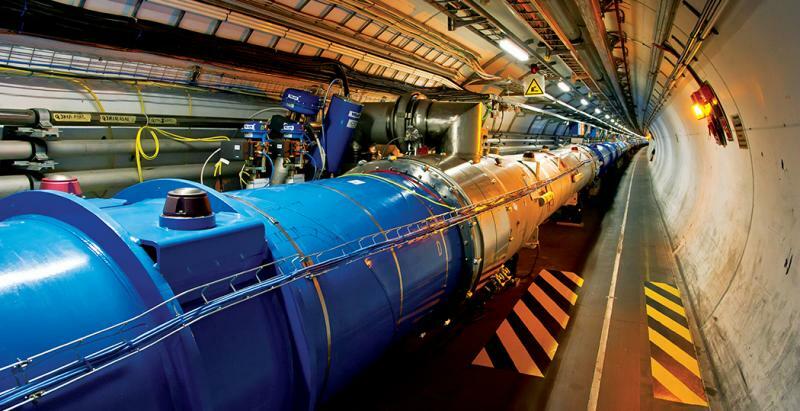 The Large Hadron Collider is the largest particle accelerator on Earth, it is the biggest and most complex experimental facility ever built, and also the largest single machine in the world. According to CERN, it consists of a 27-kilometre ring of superconducting magnets with several accelerating structures to boost the energy of the particles along the way. Both the ATLAS (A Toroidal LHC ApparatuS) and Compact Muon Solenoid (CMS) experiments at the Large Hadron Collider (LHC) detected the spikes. If confirmed, this finding could transform our understanding of the workings of the Universe. At these energy levels, physicists have detected an excess of photon particles when protons and other heavier particles collide. This suggests the presence of a new particle – one never detected before – that is produced when protons collide. CERN scientists say it could help them revise the ‘Standard Model’ – which explains how the basic building blocks of matter in the Universe interact, governed by four fundamental forces. The breakthrough they believe they have made will not provide conclusive answers, but will give physicists a huge step forward, say researchers. CERN scientists warned that the two spikes could just as easily have been the result of a statistical fluke. Even so, the finding has spawned more than ten new papers within a period of 24 hours, all propositioning a theoretical explanation for the particle, and has the physics departments of universities across the world buzzing with activity. Scientists at the University of Bristol have been analyzing data from the LHC’s Compact Muon Solenoid experiment to see whether they can detect signs for the production of gluinos (the supersymmetric partners of the gluons which hold quarks together inside protons) that then deteriorate into quarks and neutralinos (the supersymmetric partners of photons and Z bosons). If neutralinos exist, they are potential candidates for the dark matter required to explain how galaxies behave as well as the evolution of the Universe. Video – What is the Large Hadron Collider? In this video, Fermilab’s Dr. Don Lincoln explains both some of the absolutely amazing scientific and engineering properties of this modern scientific wonder.